FAQ Put-In-Bay is here! Put-in-Bay Ohio offers adults, families, and conventions many options for a relaxing vacation. Put-in-Bay’s most frequently asked questions may be found along with answers at putinbayreservations.com. If your questions are not answered here just e-mail us at our contact form. What is Put in Bay? A village on South Bass Island, Ohio. The island is located in Lake Erie, off the northern shore of Ohio. The island has been a tourist destination since the 1800s. Each Summer thousands flock to enjoy the small town charm and island vibes. Why is it called Put in Bay? The islands name may have come from Native Americans “putting in at the bay” in a ceremonial fashion. Another theory suggests that sailors would put in at the bay seeking refuge from the notorious Lake Erie storms. Yes! South Bass Island has a public school that educates students from South, Middle and North Island. The school ranges from kindergarten to 12th Grade. Put-In-Bay weather is similar to many coastal Northern Ohio locales. Spring and fall generally warrant a light jacket or sweater. Most Summers, the weather is idyllic, with plenty of sun and blue skies. Regardless, it’s always sunny in Mr. Ed’s! How does Put in Bay get electricity? Underwater cables from the mainland provide power to South Bass Island. Also, the Lake Erie Islands power provider is Ohio Edison. How many people live on Put-in-Bay in the winter? There are about 200 people who live on South Bass Island year round. Many people flee to cold a flock to the Ft. Myers, Florida area in the Winter. There are generations of island families that have lived on the island for over a millennium. This is a very common FAQ of PIB. What is put in bay island? A fun village on South Bass Island, Ohio. Here, a heap of fun bars and restaurants welcome patrons. Expect great live entertainment, plenty of libations and a time that won’t be forgotten. The island is a place like no other, a place one unto itself. The Put-In-Bay season runs from April through October. Each season begins with fisherman from several states, primarily South Dakota and Wisconsin. The season concludes with the annual Halloween Bash on the Bay. How old do you have to be to go to Put in Bay? All ages are welcome! There are many great things to do on the island for children and adults. Still, many bars require guests be 21 years old in order to comply with State of Ohio Liquor Laws. What is there to do in Put in Bay? The island has many great activities and places to have fun. Moreover, options range from para-sailing to a leisure cruise on a golf cart. A favorite past time of the island is to enjoy a libation at a local Put-In-Bay Bar. What is there for kids to do in Put in Bay? Is Put in Bay Kid Friendly? Yes, the island is kid friendly with many great things to do for a family. Kids love to ride the ferry to the island.. The Top 4 are Perry’s Cave, Adventure Bay, South Bass Island State Park and Perry’s Victory & International Peace Memorial National Park on the island. Is there a beach on Put in Bay? Public Beaches are located at South Bass Island State Park on Catawba Avenue and at the end of Delaware Avenue near Perry’s Victory and International Peace Memorial. The Island overall is very rocky, with limited swimming beaches. To do Put in Bay? There are so many great things to do on PIB. Options include State and National Parks, world-class water activities, family-friendly complexes and much more. Is Put in Bay Family Friendly? Family friendly attractions and things to do can be found all over the island. First, a ride on the Miller Ferry is the most affordable ferry option. The Lake Erie Islands Wildlife Center, Perry’s Cave & Family Fun Center, Perry’s Monument and Adventure Bay will provide many family friendly things to do while visiting South Bass Island. What city is Put in Bay in? The name refers to a village on South Bass Island. South Bass Island resides in Erie County, Ohio on the Southern Shore of Lake Erie. The village of Put-In-Bay is home to a great selection of Restaurants, Bars and Things to Do. What county is Put in Bay in? Delaware Avenue is home to the heart of the Bars and legendary nightlife. The downtown block has a carefree atmosphere with a fine range of fun bars and eateries. . The harbor views from downtown include Perry’s Monument, Middle Bass and Gibraltar Island. How long is Put in Bay? South Bass Island, where the village resides, is about 4 miles long by 2 miles wide. What Lake is Put-in-Bay on? Lake Erie surrounds the beautiful island of South Bass Island. This Great Lake is the shallowest with an average depth of 19 meters. Pleasure boaters and anglers have long flocked to Lake Erie, where Put-In-Bay is on. Is Put in Bay an island? Yes! It’s is an island in Lake Erie, off the shores of Northern Ohio. Getting to the island is easy via passenger ferry. From the island other islands of Lake Erie can be seen. These include Mouse, Rattlesnake, Middle Bass and Gibraltar Island. Is there a bridge to Put-in-Bay? No. There is no bridge or tunnel to get to the island. However, two ferry boats, the Miller Ferry and the Jet Express provide transportation to the island. Moreover, each year they bring thousands of guests to the island. 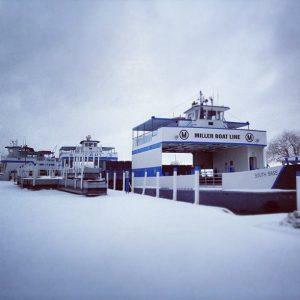 Once the ice settles in, the Put-In-Bay Ferry service stops. Islanders rely on transportation via airplane or airboat during this time. During exceptionally cold Winters, an ice crossing is possible for seasoned travelers. Of course, this is not recommended for novices. Wow! There are so many great Restaurants that it’s hard to choose one. From local fare like Walleye and Perch to a juicy burger with a view, there is truly something for everyone. Be sure to peruse our Dining Page to find your favorite places to eat on the island. Can I walk from bar to bar with a drink? No. Due to the State of Ohio Open Container Law, beverages must be consumed where purchased. Also, they cannot be carried from one bar to the next. Fortunately, nearly all of the best Put-In-Bay Bars are very close to each other! State of Ohio Law dictates that bars must close by 2:30 AM. However, the island bars begin closing around 1-1:30. This starts with the Boathouse Grill, then moves down Delaware Avenue. Fortunately, Mr. Ed’s is always open to closing time for your pleasure! Can you bring alcohol to Put in Bay? Alcohol can be brought to the island on both the Miller Ferry and Jet Express Ferry Boats to the Lake Erie Islands. However, passengers are prohibited from consuming this alcohol while aboard. Put-In-Bay Nightlife and Entertainment are truly legendary. All season long, great bands and musicians play all week long. Is there a place to buy beer and wine on Put-in-Bay? Yes. There are a couple of options for purchasing beer on the island. The Island Beverage Center, Topsey Turvey, the Boathouse Drive Thru and the Dyna Mart Gas Station. Therefore, it is recommended to purchase beer on the island as it is nearly the same as the mainland. More importantly, you don’t have to carry it with you! What time does Put in Bay close? The Bars close by 2:30 AM, per Ohio State Law. Some opt to close a bit earlier, between 1-2 AM. However, the party often continues at the Home or Hotel the guest is staying at. Ferry boat service is offered from the Miller Boat Line and the Jet Express. The Miller is a passenger and vehicle ferry. The Jet Express is passengers only. Miller Ferry departs from Port Clinton, Ohio on Catawba Point. The Jet Express departs from Port Clinton and Sandusky, Ohio. Also, private boats may access the island and utilize the public docks on the waterfront of the downtown area. How long is the Jet Express to Put in Bay? The 30 minute trip from the Port Clinton Jet Express to the island is a quick, relaxing trip to the island. Ride in comfort in the interior cabin with cushioned seats. Also, table seating is available. Others opt to ride up top and take in the Lake Erie breezes. How long does it take to get to Put in Bay on the Miller Ferry? This Ferry takes about 18 minutes from the Catawba Point Dock in Port Clinton to the Lime Kiln Dock on PIB. The leisurely trip is the fastest way in terms of time to get to the island. Do I need a drivers license to rent a Put-in-Bay golf cart? Absolutely! Golf Cart Rentals are treated exactly like all motor vehicles. Therefore, all of the normal rules apply, including driving under the influence. So, Only licensed drivers can rent and operate a golf cart on South Bass Island. Reserve Your Golf Cart early, as many days they sell out. Can I take my car to Put-in-Bay? 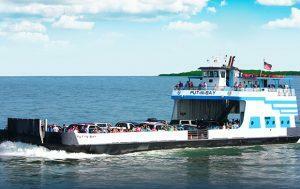 For those wanting to take their car to Put-in-Bay, the Miller Ferry provides vehicle and passenger boat service. Mostly, this is useful for guests staying on the island. However, for a day visitor, bringing a vehicle is not necessary. Vehicles are transported off every half hour in peak season, very efficiently. Where do you get the ferry to Put in Bay? Multiple ports offer transport to the island.. These include the Miller Ferry with service from Port Clinton, Ohio to South Bass and Middle Bass Island. The Jet Express provides service from Port Clinton and Sandusky Ohio with service to Put-in-Bay. What if I miss the last Put in Bay ferry? Of course we would suggest you avoid doing this. However, if you do miss the last ferry, you’ll have to stay the night. Check out our Put-In-Bay Lodging Page to find a place to crash for the night. No. Put-In-Bay Ferry Boat reservations are generally not needed. Moreover, there are many trips per day and all vessels can transport hundreds of people. So, just show up, hop on a boat and enjoy! Public Docks are first come, first serve dockage. These docks, A, B and C offer full power and water hook ups. Additionally, there is private dockage at the Keys Restaurant, the Boardwalk and Miller Marina. For a genuine Put-In-Bay experience, a car is not necessary. The island of is only 2,5 x 4 miles. Therefore, a Golf Cart Rental is the best way to take it all in. Put-In-Bay to Cedar Point is about 20 minutes from the mainland ports. The Jet Express offers service to Sandusky and Cedar Point direct during peak times. Therefore, including a visit to Cedar Point during a stay on the island is a great way to see the very best offerings of the North Coast of Ohio. Can I bring alcohol to my hotel room? Yes. All of the partner properties on this site allow guests to bring alcohol to their room. It is unnecessary to purchase beer and wine on the mainland. Fortunately, there is a beverage center on Put-In-Bay with prices similar to the mainland. Which Put-in-Bay Hotels have swim up bars? The Commodore Resort has a swim up pool bar onsite, Mist. Here, guests can enjoy a cocktail poolside in the large cabana bar, or swim on up for a drink at the bar. The DJ keeps the crowd hype and the party rocks all day long. Private cabanas and table service available. Do your hotels have a minimum stay? Most Put-In-Bay Hotels require a 2 night minimum stay on weekends. However, on weekdays, guests can often find 1 night stays. On select holiday weekends, a 3 night minimum is imposed. Put-In-Bay Vacation Rentals also have a 2 night minimum on weekends. Sometimes though, they offer 1 night specials. Be sure to sign up to Win A Free Weekend. Here, you will join the mailing list and stay up to date on the latest deals. Put-In-Bay Lodging is in high demand and at times short supply. Therefore, it is suggested reservations for Put-In-Bay Cabins and Put-In-Bay Hotels be done well in advance. Sought after weekends like Independence Day Weekend and Labor Day often sell out months before the date. So, be sure to Make Reservations early to ensure a place to stay in Put in Bay.